Help Camilla Predict Space Weather! In 2010, the Solar Dynamics Observatory (SDO) launched from Kennedy Space Center, leaving behind its mission's mascot, Camilla Corona SDO. Seeking a way to keep her astronaut friends and SDO safe, Camilla is going to send them space weather forecasts! Space weather and the forecast of solar events is a brand new science, so Camilla will need the help of her friends and fans to understand the data and, more importantly, learn how to forecast activity on the Sun! Your mission: First, learn about space weather below. Second, visit our Forecast page to access the Space Weather Submission Form; this will lead you through your space weather prediction step-by-step! After submitting your forecast, you will get immediate feedback about how your results compare to those of other forecasters. Make sure to check the Space Weather News section of this page regularly for information about how accurate your forecast was! Space weather refers to conditions and processes occurring in space that have the potential to affect Earth and its atmosphere. Space weather processes include coronal mass ejections (CMEs) from the Sun, solar flares, and solar wind. These processes can cause energy and particles from the Sun to be hurled into space, which can cause disruptions in the Earth's magnetic field. Disrupt our navigation systems (i.e. aircraft, GPS). Interfere with communication systems on Earth. Cause colorful auroras, often seen in the higher latitudes. Damage sensitive electronics on orbiting spacecraft, like SDO. For more information and resources related to space weather, visit our classroom page. Forecast space weather at the same time as scientists and submit your predictions to us! Learn how on our Forecast page. Educators! Bring space weather into your classroom or center! Help Camilla create forecasts, interact with scientists, and use live data to satisfy national education standards. Visit our Classroom page for more information. There is currently a large coronal hole on the Sun, which is intensifying the solar wind stream heading to Earth (see image). This activity may cause auroras for sky watchers in higher latitudes from June 23-24. On June 18, NASA's STEREO B satellite captured footage of a solar flare and CME on the back of the Sun. 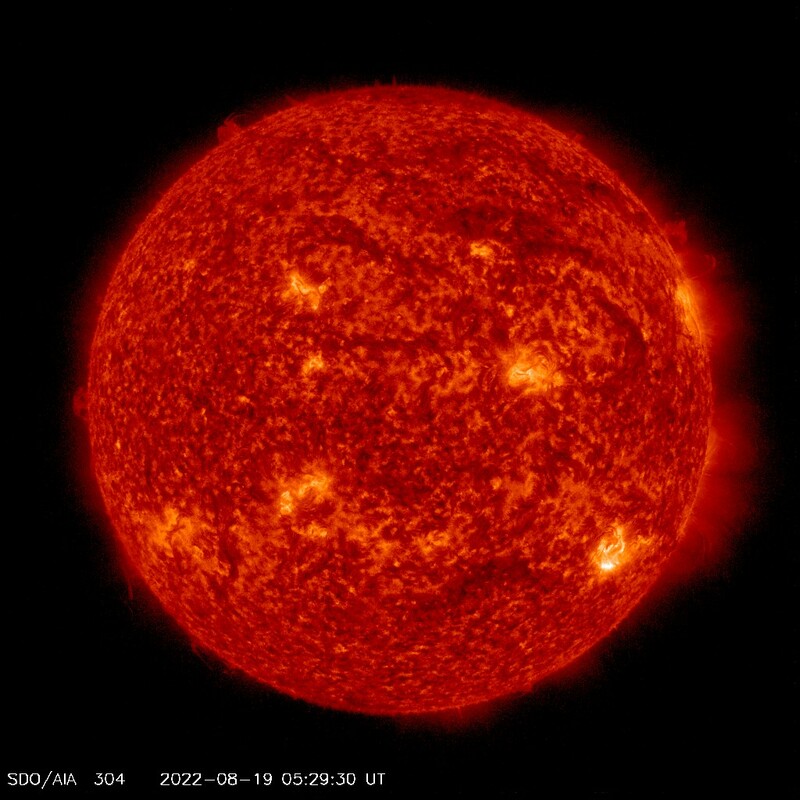 The active region these events stemmed from is rotating to the front of the Sun and it could potentially cause Earth-directed solar events. Do you predict there will be any space weather events in the next 24 hours? Submit your forecast! 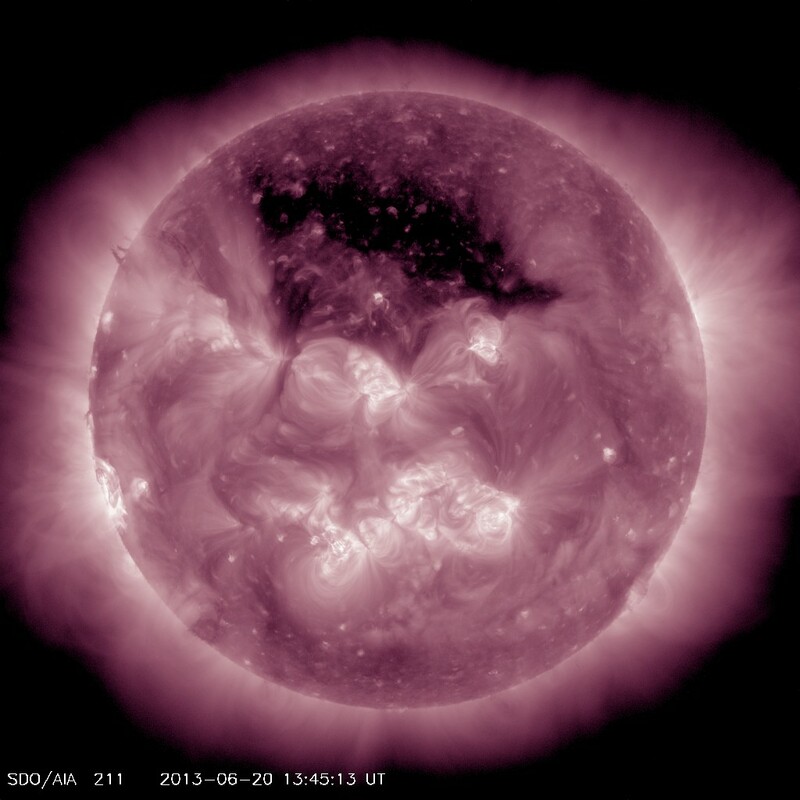 SDO captured this image of a large coronal hole (dark area) on the Sun today.